In comparison with its ‘younger bro’ D25WS single-motor system, D25WD has an external battery (additionally up to 15 operating hours) on magnet mount, alongside with the internal battery. So the total operating time per single charge of the D25WD is about 45 hours. The focus knob can be elongated with a plastic extender on magnet mount to make operating more comfortable. And the third difference – D25WD has a small brass knob at the top to control the second channel (normally – iris or zoom). The D25WD hand unit has an external tablet battery in an aluminium housing that is mounted on magnets to the back side of the device. Even though the operating time per single charging is up to 45 hours, this hot-swap battery can sometimes be a rescue. The external battery adds about 15 hours to the internal battery’s resource making the complete operating time half longer. The D25WD is designed to operate 2 lens motors (KM1 and/or KM2). The front big and top small knobs can be paired with Kinorg lens motors. It has a wireless function of camera start/stop (red button at the top side). The hand unit supports both manual and auto calibration. The unit can set the reverse mode of the motors rotation. Also it allows to memorise 2 positions of the Lens focus and transit into these position by a single click. See the User Guide to get more details. 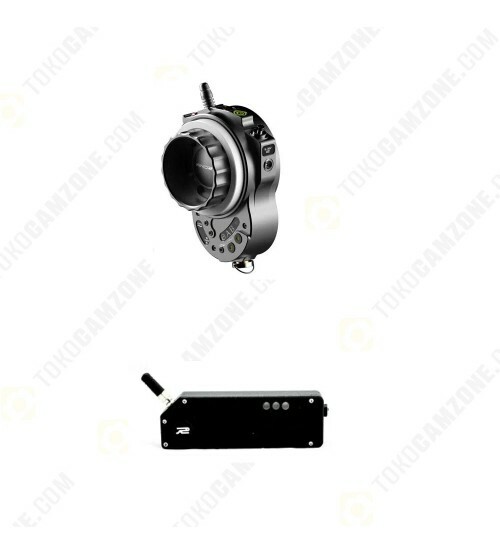 A4F is a 3-axis wireless lens controller designed for the Fujinon Cabrio and S6 lens families with servo engines. The external antenna gives operating range up to 150 m.
A4F can simultaneously work with up to 3 Kinorg hand units – 1-axis wireless follow focus D25WS, 2-axis wireless follow focus D25WD and 1-axis wireless gimbal focus B20. FIZ can be controlled simultaneously. The best approach is to combine D25WD and B20 to cover all three channels of A4F. A videoclip below demonstrates A4F with B20: the pairing by a press of a button and operating process. The A4F unit has 3 buttons – one per focus, iris and zoom channel – to confirm pairing with the Kinorg hand units. Each button is also an indicator glowing or blinking depending on the channel mode. It has 2 connectors – 5.5×2.1mm power port and 20-pins Hirose connector for the connection to the Fujifilm servo engine. Its housing is made traditionally of hardened aluminium alloy and covered black with a polymer paint. A4F switches on when the power cable is connected. The calibration is not needed – the lens FIZ rings are immediately going to the position according to the hand units knobs.